What do you get if you combine an air traffic controller, recipe a flight engineer, a dentist, a farmer, and a soil scientist? You get a Thirsty Beaver, a Soggy Biscuit, a Potluck, a Crafty Butcher, and some Bear Buns—all mountain bike trails in Cumberland and all hand-crafted by this group of men, also known as the River Rats. The River Rats, composed of Al Munday, Terry Lewis, John Simard, Andy Quin, and John Wall, met years ago through their shared love of running. Though they initially ran on roads, they soon discovered that trail running was more interesting. They tried to get other running friends from the Comox Valley Road Runners to join them on the trails, but most thought the roots and rough terrain would lead to injuries. So they decided to form a sub group that exclusively ran on trails, calling themselves the River Rats. The trails above Cumberland became one of their favorite places to run, but in 2006 a severe wind storm came through that brought down hundreds of trees. It was clear to the River Rats that there was a lot of work to be done to get the trails back into shape. So they got out their shovels and their chainsaws and they began the job of trail restoration. Spanker was the first trail they repaired, as almost the entire trail was covered in fallen trees. Some trees were easily cut and moved off the trail but some were too dangerous to move. The sheer number of fallen trees had created a situation where cutting one log could create a dangerous cascade. The River Rats discussed the problem and decided to construct an A-frame over a particularly dangerous log pile. That A-frame and the repair of the trail was their baptism into trail building, as they realized it was good fun to work on trails together. They soon moved from repair to creation—and they haven’t stopped since. Bear Buns was the first trail completely built by the River Rats. While searching for an area to build a trail they noticed a strip of trees that ran parallel to Perseverance Creek. Since it was a riparian reserve, the Rats were confident it would never be logged, so it seemed like a good spot for a trail. It wasn’t long before they got to work. Though Bear Buns is the River Rats’ first trail it’s also a testament to their talents, for the trail is absolutely fantastic. The path skirts towering trees and winds through thick salal and fern. The views of the creek and the valley are breathtaking, especially when the fireweed is in bloom. Furthermore, since the trail follows the creek, the sound of the rushing water is always there to keep you company—and to keep you cool in the summer months. But it’s not just the geography that makes Bear Buns an interesting trail, for the smooth and fast trail includes an A-frame, two short and curvy boardwalks and one boardwalk that hugs the side of a steep slope. Despite their rumbling stomachs they had a good laugh about the bear who feasted on their lunch. So they decided to name the trail Bear Buns to commemorate the hungry bear with a taste for cinnamon buns. Bear Buns was the first of many trails. Specifically, the River Rats have nearly 10 trails to their name, which add up to more than 12 kilometres of trail length—and they aren’t done yet. In fact, right now they’re working on an addition to a trail they completed just a few months ago, called Potluck. Their highest trail yet, Upper Potluck, as it will be called, will include a curved bridge over a creek, a switchback section, and a crossing of upper Trent River (low water only). As you can imagine, building a mountain bike trail isn’t easy. Before the River Rats even start to dig they spend hours walking an area, bushwhacking and scouring the landscape to get a sense of what sort of line the trail should take and what features should be included. For example, on one of their newest trails, christened That Dam Trail because it skirts Allen Lake Dam, John Simard found a huge fallen log while bushwhacking through the woods. When Simard saw the log he knew it was a feature that needed to be included in the trail—so the Rats made sure the trail went in that direction. Now That Dam Trail has a 90-foot long log ride that challenges even the most seasoned of riders. Speaking of feet, the upper and lower Thirsty Beaver trails boast exactly 1,000 linear feet of boardwalk. The raised platform made from hand split cedar boards snakes over creeks, ponds, and around trees and is the most treasured feature of the trail. They built that length of boardwalk on purpose. “We measured it one day and found we had 960 feet of boardwalk,” recalls Munday. “So we decided we had to add an extra 40 feet to make it an even thousand.” Forty feet may not seem like much, but that extra length could easily add up to 40 hours of work, since Lewis figures that every second of time riding across a boardwalk equates to at least one hour of building time. Trails constructed by the River Rats are considered by many to be works of art. In fact, most riders remember the River Rats’ trails for the ingenious structures they find along the way. Structures such as a double teeter-totter, two gravity defying wall rides, a floating bridge, and a massive cedar stump with the trail right through it. Though the features are exciting and make what many mountain bikers call the ‘Disneyland’ of trails, it’s not just the structures that make these trails special. The graceful bank of the corners and the well-engineered switch-backs are also admired. And it’s not just mountain bikers who appreciate the River Rats’ work, for hikers and trail runners enjoy their trails every day. Since the River Rats are a group of men with varied backgrounds there have been times they’ve disagreed when building the trails. They see a forest floor as a blank slate, and each person may have a different vision of the type of trail that should be built. That being said, the trails created by the River Rats are always built collaboratively. They recognize each other’s strengths and weaknesses and use that for their benefit. For example, Munday and Lewis describe themselves as the ones who rough in the trails, but John Simard finesses the trails and makes them special. “He’s like the finishing carpenter, and we’re just the framers,” Munday jokes. Since the River Rats have built trails together for so many years, they’ve found that they don’t need to talk much while constructing the trails. They are such a cohesive team they can handle even a tricky job such as splitting cedar without uttering a word. Lewis and Munday explain how one of them will hold the axe while the other one swings the maul, and instinctively they’ll know when to stop swinging and when to reposition the axe. “We’ve been doing it for so long, we can create a huge pile of split cedar, and we’ll hardly talk at all.” Simply put, the River Rats are a well-oiled, trail building machine. The River Rats enjoy biking so much that they take holidays together to explore other trails. They’ve ridden the trails of Whistler, the Sunshine Coast, interior BC, the famous Moab trails of Utah, as well as trails in Washington, Oregon and California. They enjoy experiencing trails farther afield especially since they get ideas for trail craftsmanship and interesting features. Even so, the more trails they visit the more they realize that the trails around Cumberland are something very special. What does the future hold for the River Rats? More trails, of course. In fact, the River Rats have a long list of trails they’d like to build. Their eyes light up when they talk of beautiful lakes and vistas just waiting to be revealed through their work. Whatever their plans, the people of the Comox Valley—as well as anyone who visits Cumberland’s trails—owe the River Rats a debt of gratitude. But the debt is easily paid, since the best way to say thank you is to enjoy the trails they’ve built. To visit the River Rats trails yourself, visit www.cvmtb.com/index.php/trails-maps/maps/cumberland-trail-map/ to see an online map of the Cumberland trail system. Keith and Holly Foraie practice their dance moves with other participants in preparation for the upcoming annual Dance de Rock in September. local social dance instructors—and husband and wife team—Keith and Holly Foraie hope to reach one of the goals they set for themselves when they started. That idea is Dance de Rock—the September Comox Valley dance event that raises money for the Cops for Cancer Tour de Rock and other Valley cancer charities. This year’s event will be held September 14-16 at the Florence Filberg Centre in Courtenay. the genesis of this popular dance weekend is well known. Keith was a telecommunications technician in the military in 1999 when an officer at CFB Comox was diagnosed with cancer. The base organized a head shave to raise money, and Keith (already a dance instructor) attended. The experience got him thinking it would be great to do something similar that involved dance. However, he was posted to Nova Scotia and put the idea on hold until the couple returned to the Valley in 2003. The first Dance de Rock took place in September, 2004. What many don’t know is that the Foraies decided early on that the event needed something to give it longevity. “When we discussed this, discussed doing it, what I set for a goal was 10 years or raising $100,000,” says Keith. Ten years would make Dance de Rock the longest running dance event on Vancouver Island—a title currently held by Cowichan Goes Country, which ran for nine years through the country/rock craze of the late 80s and early 90s. And the $100,000? “It seemed like a good number to go with,” says Keith. Dance de Rock is now in its ninth year, and has raised $94,000 for cancer charities. There is a good chance the event will top their goal of $100,000 this year. So what happens if the event does reach its fundraising goal? “Let’s not think about that,” says Holly, with the sort of passion of someone who loves what they’re doing. Which might seem surprising—what keeps two people organizing a three-day dance event with instructors, classes, students, food, dances, DJ and volunteers that put in close to 300 person-hours over the course of the weekend? Well, there is the dancing of course. 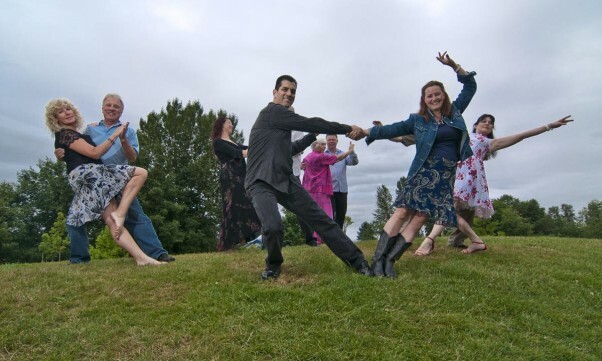 “The Comox Valley is a dance Mecca of Vancouver Island,” says Keith. “We’ve got more dancers per capita. The instructors don’t always know where the Comox Valley is, but when they come up here and see the level of dancing up here, they’re just amazed. And that means classes for different styles of dance and everything from beginner to intermediate and beyond. West Coast Swing, Hustle, Night Club, Two Step, Waltz and Cha Cha have all made it onto the 2012 schedule. The classes are taught by world-class instructors booked specifically for the event—like Mario “Swing Daddy” Robou and his wife Stephanie. Mario is the youngest person every inducted into the Swing Dance Hall of Fame. Then there is Jim Minty and Gerald and Robin Cote—all professional dancers and instructors with tremendous knowledge and experience to share with students. That variety and level of instruction attracts dancers from all over Vancouver Island and the Lower Mainland. Many of the dancers are veterans of the social dance scene in the Valley and on the Island. However, the event is very much open to beginners. In fact this year, Dance de Rock is offering a spectator’s pass for anyone who has always wanted to try social dance, but has never given it a go. The pass includes the Friday evening dance and one beginner workshop. But the Foraies encourage all beginners to come out and give the weekend a try. That cause, obviously, is raising money for cancer charities. The weekend of dance includes a Bald Eagle Challenge at the Saturday night dance, when participants who committed to raising pledges shave their heads. All funds raised from the head shaves go directly to the Tour de Rock. Then there are the raffles, and all the proceeds from the Dance de Rock (ticket prices minus instructor fees and other costs), which go to local cancer charities like the Mason’s Cancer Bus and Hope Afloat, whose members volunteer at the event in return for a charitable contribution. Hope Afloat is an all-woman’s cancer survivor dragon boat team started specifically for breast cancer survivors in 2001. At the time, research was showing how important physical exercise was for the physical, emotional and spiritual well-being of cancer survivors. Paddling especially helped build the upper body strength necessary to create flexibility for anyone who had surgery, like lymph node and reconstructive surgery. Today, membership is open to all woman survivors of cancer. Beyond the physical exercise, however, the organization has an important message to share—that there is life and laughter after cancer. And the Dance de Rock seemed like a perfect fit. As a non-profit organization, the entire donation is put toward the work Hope Afloat is doing. For example, Hope Afloat allocates some of the Dance de Rock donation toward the purchase of equipment at St. Joseph’s Hospital to detect and treat cancer. They also offer a bursary every year to high school students graduating in the Comox Valley with an interest in health sciences. The hope is to encourage students to pursue courses of study that will help treat and cure cancer. And of course, Hope Afloat uses the donation to purchase paddles, life jackets and any other equipment they need to train in their dragon boat. Looked at this way, the impact of the money raised at the Dance de Rock is quite obvious, something that is not lost on the Foraies. And perhaps that is the thing that makes Dance de Rock so amazing for everyone—community. “We have a lot of support from some very good friends who actually do a lot,” says Holly. That includes participants who house the instructors for the weekend, so they don’t have to stay in hotels. Often these are on larger properties in more rural parts of the Valley, where it’s not unusual to see a deer with fawns walking through the backyard at breakfast time. Sponsors and volunteers also play a huge role. 19 Wings Foods cooks the meals; the Black Creek Lions Club tends bar at the dances; and, of course, Hope Afloat helps prep and serve meals. Quality Foods supplies a voucher that goes toward purchasing the raw ingredients for the meals, and Water Pure and Simple provides financial support as well. Other businesses, like the Anchor Motel, offer Dance de Rock out-of-town participants discount rates. “Once you’ve established a working relationship, it’s easy to keep going,” says Holly. Regardless of the support, planning Dance de Rock is a year-long process, with hours and hours and preparation and planning. Holly often books instructors for the next event not long after the last one is over. The process, though, has very much become a labor of love.